Haz Mat Team at 77 Garlisch Avenue, Elk Grove Village (Over 260 more photos on Facebook.com/CardinalEmergencies). Elk Grove Village police and firefighter/paramedics responded about 2:55 p.m. Friday to a Hazmat Incident at 77 Garlisch Drive. Firefighters received a report of a spill from a 55-gallon drum. The hazardous material is listed as Class 9 — unknown chemical. At 1:52 p.m. the wind was from the northwest at 8 mph. Air temperature was 82°F with a dew point of 61°F. No victims were reported early in the incident, but a second ambulance was dispatched. 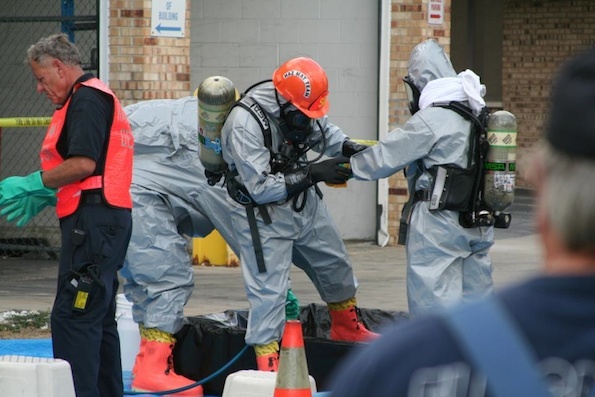 A HazMat Level 2 was requested with a request for MABAS Division I HazMat techs only at about 3:11 p.m.